Update: Tim's Crane and Rigging is pleased to announce the newest addition to our crane rental fleet, a Terex/Demag Model AC250-1 All-Terrain Crane rated at 300 Ton capacity, and a max tip height of 378 feet. It is ideally suited for power plants, paper mills, heavy construction projects, and plant maintance jobs. 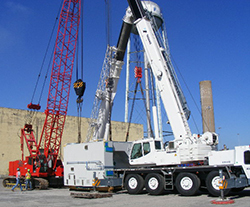 Call us for information on this crane or any other cranes in out fleet.